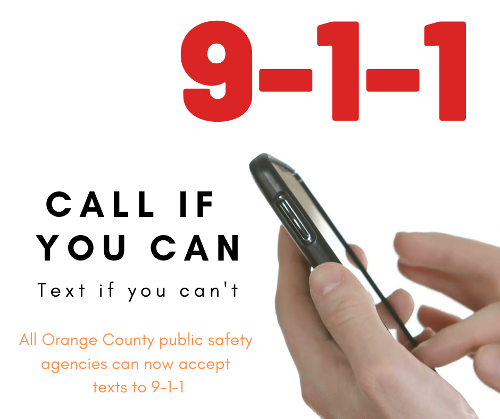 Mobile users in Orange County now have the ability to send text messages to 9-1-1, giving hearing and speech impaired residents, or those in situations where it is too dangerous to dial 9-1-1, a potentially life-saving option. This new tool is available to the public using a mobile phone or device. The location services on the mobile device must be enabled. Enter the numbers "911" in the text "To" field. The first text message to 9-1-1 should contain the location and brief description of the emergency and the type of help needed (police, fire, ambulance). Text in simple words. Do not use abbreviations, emojis, or slang. If you can, always contact 911 by making a voice call, "Call if you can…text if you can't." Photos and videos cannot be sent to 911. They cannot be received at the 911 call center at this time. Text must be in English. There is currently no language interpretation for text available. It remains in development.